shaping of copper, bronze, glass and iron. For his Xylem bench, he examines charcoal under the microscope and makes enlarged studies of these to inform his intuitive approach of carving directly out of oak. 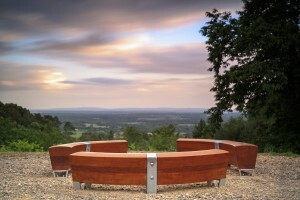 This bench will sit at a new, accessible view point at the National Trust location of Gibbets Hill, Hindhead. From the National Trust tea room take the route towards Gibbet Hill, the bench is on the right before the main viewpoint. Giles Miller is interested in how visitors of iconic sites and places of natural beauty often leave personal or commemorative messages for loved ones. He has designed a shelter from which to sit and look out one the beautiful view from Winterfold. Working with surface specialist, Kirsty Little, they will be creating a surface of wooden shingles engraved with words and messages from local people and visitors. Perspectives will sit nestled within the woods with a clear view over the South Downs providing shelter and a space for focused contemplation. Click here to watch a video about Perspectives. Looking at the viewpoint from Car Park 5, take the Greensand path to the left and the seating is immediately on your right. Perspectives is very near the car park so wheelchair access would be possible with a strong companion. Russell Jakubowski is creating a dynamic form inresponse to the result of a great cycle of marine sedimentation that lasted until the end of the Cretaceous period when the land lay beneath water. The layers of sedimentation, contours of the land and the visible forms and cycles of nature inspires this design. Russell has carried out research into recycled plastic sheets as an environmental, robust alternative to wood. Sixty sheets of the wave like shapes will be bolted together. 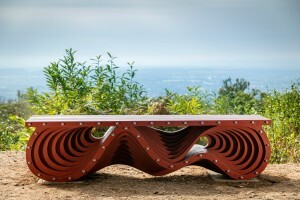 The Contour bench will sit at the breathtaking view point at Reynard’s Hill in the Hurtwood. From Car Park 4, walk up the Greensand Way path to the viewpoint. Greensand Lane and Barhatch Road, GU6 7NL.Full map on www.friendsofthehurtwood.co.uk. 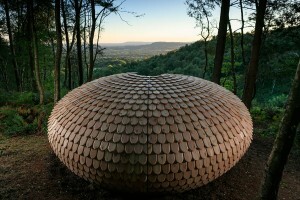 Matthew Burt takes his inspiration from the local landscape. 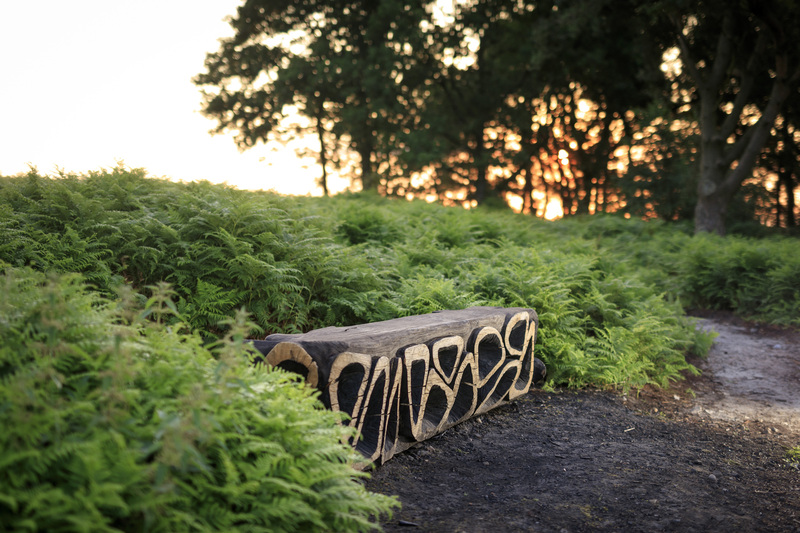 His Converse bench arrangement will see beautifully crafted benches in an arrangement that allows for social conversation and picnics as well as facing out to the beautiful, lesser trodden spot at Holmbury Hill. This location is fully accessible and the bench arrangement is designed to allow for wheelchair access. From Car Park 1, start the footpath with the pond on your left, the benches are a short walk from here. 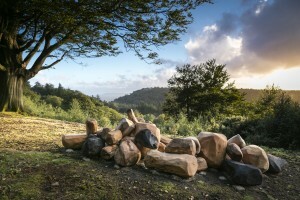 Sculptor Tom Nicholson Smith is inspired by Greensand itself. He has looked at the microscopic particles noting their shapes and wide range of tones. He will create a grouped arrangement of carved oak forms that represent grains of sand. This allows for an informal seating arrangement ideal as an opportunity for walkers to stop and enjoy the view at Hascombe Hill. Facing the White Horse pub, take the path up the right side (Nore Lane) until the start of the footpath on the right beside a garage. Follow this to the top of the hill bearing left. You can also access each of the artworks using the iFootpath app, click on the logo for further information.